Need cash in a rush? In a bid to widen Filipinos’ options for short-term financing, Tambunting Pawnshop launches Tambunting Online as a quick, convenient, and secure way to get much-needed funds. Tambunting Online, the online division of Tambunting Pawnshop, is specifically designed to meet Filipinos’ evolving lifestyles and keep up with their changing needs. The online service aims to fulfill Filipinos’ short-term financial needs by getting cash without having to leave their desks, privately and safely. A three-way partnership between Tambunting Pawnshop, MFT Group of Companies, and GrabExpress, Tambunting Online takes away the hassle as well as the privacy and security issues that traditionally accompany the practice of pawning one’s valuables. Tambunting Online is extremely user-friendly. By logging on to www.tambunting.com.ph, users can provide information about themselves and the valuable items for evaluation, with help from a virtual assistant when necessary. There is no need to submit documents or answer lengthy forms. Tambunting Online’s team of experts then reviews the item and gives a guaranteed best offer, which is sent through email. All these are done in utmost privacy. 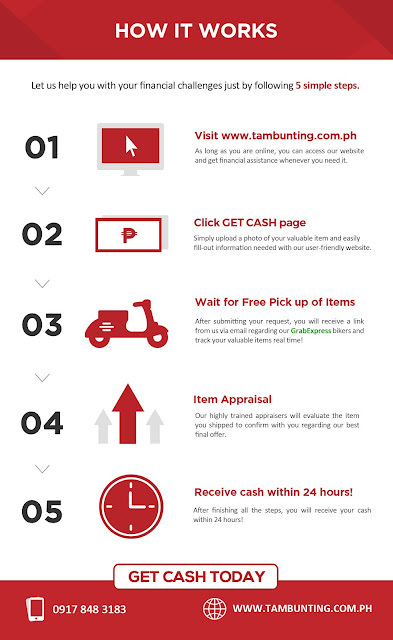 Visit the www.tambunting.com.ph and get financial assistance whenever you need it. Click GET CASH page and simply upload a photo of your valuable item and easily fill-out information needed. Wait for free pick-up of items. After submitting your request, you will receive a link via email regarding their GrabExpress bikers and track your valuable items in real time. Item Appraisal. Tambunting’s highly trained appraisers will evaluate the item you shipped to confirm with you regarding their best final offer. Receive cash within 24 hours. After finishing all the steps, you will receive your cash within 24 hours, either as a bank deposit or as a remittance via Palawan Express. “Filipinos are increasingly turning online to do their financial transactions. We saw that gap existed in traditional financial products, and turned to Tambunting Pawnshop to propose the development of online services. They saw the opportunity to offer an innovative, value-added service that would meet the lifestyle of their market. 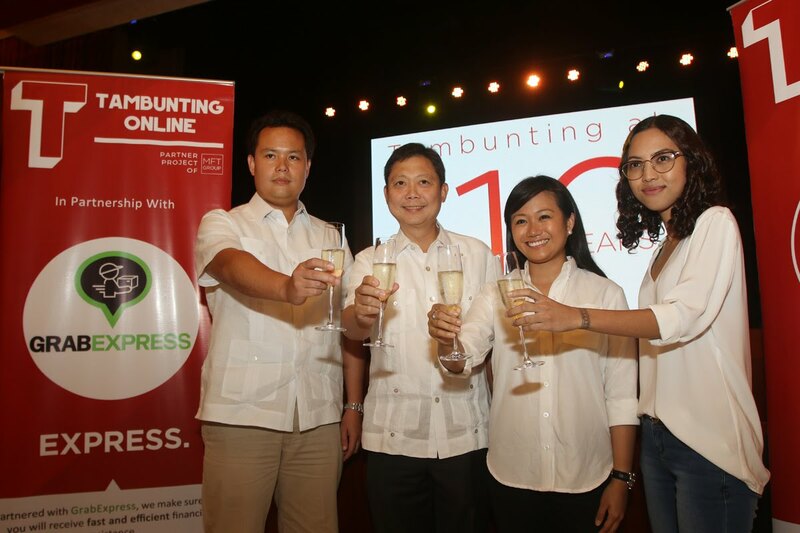 We are happy to see how Tambunting Online has brought together traditional and fresh ideas that would benefit the customer,” said MFT Group of Companies President and CEO, Mica Tan. “As Tambunting marks its 110th anniversary, we are pleased to offer something that we know our market wants and needs. Throughout the years, we have developed a good ear for what our market wants, and Tambunting Online answers the need for faster, more convenient, yet safe transactions. We are pleased to be working with like-minded partners who share our goals in making this groundbreaking service available to the Filipino public,” said Ramon Tambunting, President, Tambunting Pawnshop. “We can assure Tambunting Online users that GrabExpress bikers have undergone a strict accreditation process prior to onboarding, which includes credit investigation and clearances. We are proud to be part of this project, which is a testament to our commitment to ensure the safe and secure handling of valuable items, and to help the Filipino public meet their ever-changing financial needs,” said Angeline Tham, Head of GrabExpress, Grab Philippines. With Tambunting Online, getting cash in a rush has become safer, easier, and more convenient.